Luke 2 with Amy Grant singing Breath of Heaven. This video is Donny Osmond singing Mary Did you Know put to pictures. I recently sat down to read a book that was highly recommended by a good friend. I don't know that I would have ever picked this book to read, myself, but as it was given to me I felt I ought to read it. The book I am talking about is Give Us This Day by Sidney Stewart. 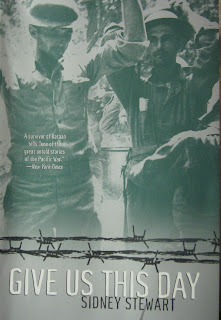 It is the true story of a survivor of the Bataan Death March. It took me a couple days to get past the first page or two, but then I was drawn in with a vengeance. It took the better part of a day to read the remainder of the book. I could not put it down. But OH how I cried! I was warned that it was a hard read. It is most definitely NOT for the faint of heart. The night after I read it I could not sleep. My mind simply would not be quiet. It had too much to talk about and discuss with me. It is an incredible story. I was profoundly moved by the underlying story of faith that carried this man through this horrendous experience. Thank you, jb, it was/is a really good book! "Sometimes, son, men know not what they do. They cannot help sometimes when they lose faith in themselves, sometimes even in God. But God is just. Your God is a just God." Suddenly I felt stronger again. I reached over and touched [my friend's] body. It was growing cold now. I looked down at his face. It was strange to me that I had not noticed how very thin he had become, how sunken his cheeks were. He had suffered, he had wanted to live. He had been good, always kind and good. I looked up, closing my eyes, and I could feel God about me. I knew that God forgave him. All at once I knew that God had taken [him] home. God was good. I had avoided going out to the stores on Black Friday and the next day. My hubby and I spent those days with some dear friends, instead. The following Saturday, December 1st, I entered the foray of Christmas shopping. I really wasn't looking forward to it and still don't relish the idea of going out to complete the job. However, on that Saturday, I woke to find 4 inches of snow on the ground. I don't really like driving in it, but I LOVE snow. I went through the Christmas jar we have for the kiddos to enter suggestions for what they might like for Christmas. Among the little papers that made requests for things like a football or a basketball hoop or a new bike I found this piece of paper that made my heart melt. For those who may not be familiar with my family, my hubby and I are the legal guardians of 4 youngsters who have not lived with their parents for 3 1/2 years. This is their 4th Christmas with us. On this little piece of paper from the Christmas jar I read, "I want to live with my mom and dad." Of all the gifts this young lad could ask for he had included that request. Although I could not grant that request of this young boy I kept that thought in my head as I headed out into the snow and traffic. Shopping was a pleasure. I enjoyed looking for just the right gift for each person. Upon returning home, however, I found the kitchen to be a mess and a headache was coming on. I knew I didn't have time to rest due to friends coming over that evening. So, I slipped my new Josh Groban Noel CD into the player. Somehow, listening to some good Christmas music made my task of cleaning so much easier. Later on that day my family and I attended a church Christmas party. It was set up as a journey to Bethlehem. We were given tokens we could use to "buy" our food and such. We sat on blankets in the hall as we watched a simple production of THE Christmas story. As we gathered with friends that evening in our home I felt grateful for all the good things that had brought the spirit of the season to my heart.